You’ve probably seen the articles around the Internet: “What advice would I give to my teenage self?” The advice invariably refers to finding a mate, finding purpose in life, and protecting your skin. What most people realize as they hit that point of “middle age” is that skin protection would have been a very easy thing to do in their teens, 20s, and 30s. It is in the 30s, 40s, and beyond that people begin to reap the consequences of their teenage decisions. 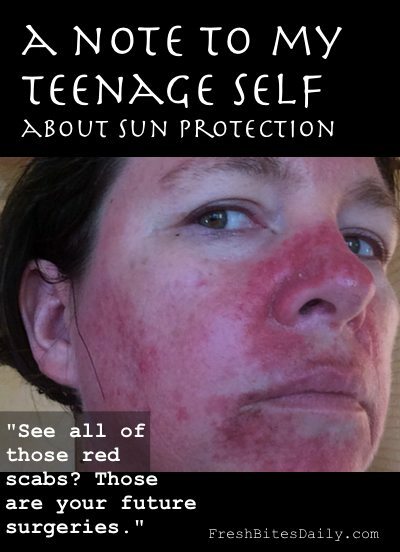 I write this at age 46 after six different excisions for non-melanoma skin cancer and this post is my version of “The advice I would give to my younger self.” It was inspired by an invitation to try Goddess Garden sunscreen and to post about it here. 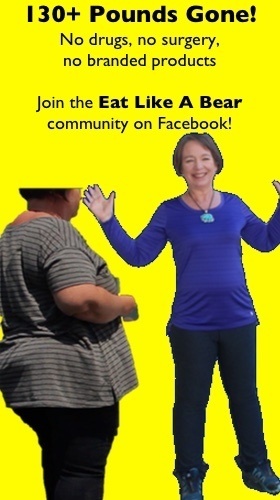 I agreed to try it and felt it was a good time to share my story here on Fresh Bites Daily. I write from California and so I will first clarify that I was never even a “sun bunny.” I didn’t “lay out” for a tan for the most part but I did have a few very memorable sun burns in my teens, primarily due to not appreciating the conditions in which I would burn. One bad sun burn was in high school during a 3-day tour of college campuses in which we were outside for most of those days. My face burned so badly that my nose blistered. In that case, a hat was all I needed. The rest of my body was fairly well clothed. My other burns were similar: Just poor planning without a good awareness of the circumstances (and danger) of a sun burn. The note to my teenage self might even include this picture but it requires a bit of explanation. This picture is after the six excisions — one excision on my arm, two on my scalp, one on my forehead, one on my cheek, and one on my nose. The nose required a skin graft in which my cheek skin was actually stretched across and grafted to my nose. It requires running around for a week with the cheek skin still attached at the cheek on one edge and the skin sewn on the nose on the other edge. It is very bad business. Very, very bad business. After all of those excisions I tried a medication that you apply to your skin that attacks precancerous cells. The precancerous cells become inflamed, turn into scabs, and then fall off. You can see that my entire nose and chin scabbed, areas on my cheek and near my mouth scabbed. It is one way to treat skin cancer in the pre-cancer stage. It sounds like a pretty swift idea but the cream has side effects. In the two times I have used it (once on my neck and once on my lower face, as you see in this picture) by about Day 10, I struggled with depression. The depression was not from looking freakish as pictured, it was chemical. I have used the medication twice and I may use it again on another small area of my skin, but I have to manage my life knowing what the medication will do and that I will need a recovery period. All that is to say that the picture here is of all of the potential excisions I was going to have. May the medication actually work because I do feel like I am already running out of skin. To my teenage self: Prevention is far, far easier than excisions, skin grafts, and pre-cancer skin treatments. 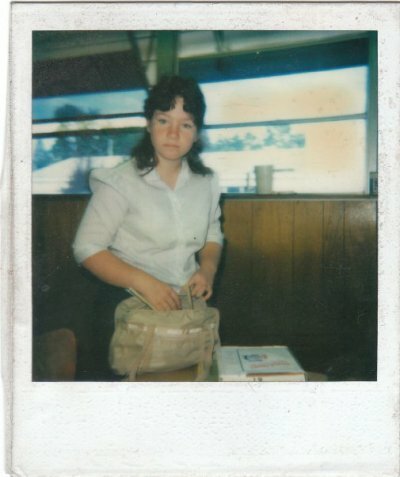 I’d send the note back to about the time this Polaroid picture was taken, circa 1985. We make better decisions these days because we are more aware of the devastating effects of the sun. My boys wear hats all the time. Even out with friends, my teenager wears a hat. It has become part of his signature style and works as a fashion statement but the original reason he wears it is skin cancer prevention. I am a strong believer in (1) hats, (2) long-sleeve shirts, and (3) safe sunscreen. A hat and long sleeves are my daily solutions but when I am on the beach, in the desert, in the pool, or near the equator, I wear sun block like it is my religion. I spent a couple of weeks in Kauai one November and, even in that winter month, you could feel the sun’s rays baking your skin, almost immediately upon going outside. The sun felt stronger there than it does here in central California in July at noon out on one of our sun decks. Relying on coconut oil in a circumstance like that really is nothing more than dermatological job security. Q: But we need the sun and sunblock blocks its ability to make vitamin D. Why would I wear sun block? We do need some sun exposure — it is our very best source of vitamin D. When the sun hits our skin, our body turns it into vitamin D. In my own routines, I cover up while gardening and I do lay out all year long as weather permits. When I lay out, I expose my legs and torso but keep my face, hands, and upper chest and neck covered. I have the most skin damage in those areas and do not want to increase their exposure. It is a relaxing ritual that I try to do for thirty minutes as often as I can manage. When I am not following this regimen I divert to my core belief system: (1) hats, (2) long-sleeve shirts, and (3) safe sunscreen. Because of the importance of sunshine on our skin and because consumers have become increasingly concerned about the ingredients in conventional sun blocks, there is a growing movement to ditch sun block altogether and just go natural, letting the sun do its thing on our skin. Some people simply use coconut oil as a sun block, an oil with a natural SPF of up to about 8. Coconut oil was actually the main ingredient in the product “Coppertone,” popular in the 1980s that helped sun bathers get a heck of a tan. You could stay out longer without burning and, over the course of a summer season, end up with some impressively brown skin, a goal of just about all women in that period. That is the generation of women who, right now, are beginning to provide job security for dermatologists across the country. Coconut oil may provide you with a bit of protection but if you hit the beach for the day and this is your only strategy, I cringe (especially if you are as white as I am). Many have taken this path and the end of the path is a difficult one. Q: How about I just make my own sunscreen? Fresh Bites Daily is a big DIY website but a quick search through the site will show you that there is no recipe here for sunscreen. Why? There is no research-based DIY recipe that I have found on the Internet and I am simply not going to risk one sun burn to try out a recipe. The formulation would require very specific knowledge of the ingredients in the lotion itself and how they interact with the SPF ingredients. As I said above, my face is as it is from just a few bad burns. I don’t leave it to chance and, at this stage, the DIY approach has too much chance in it for me. And so when a hat is not enough and you are seeking a solution with more protection than the SPF of cooking oils, you really need to look in the family of zinc oxide, a safe sunscreen. Zinc oxide is an ingredient in more natural brands of sunblock. The zinc oxide itself has a strong SPF — actually strongly than some blouses in my closet. Much like the hat or the shirt, zinc oxide is actual coverage from the rays of the sun. Conventional sun blocks work to absorb and counteract the rays of the sun, right there in the layers of your skin. Your skin has to absorb the active ingredients of the sunblock in order for it to work (which is why you are supposed to wait 10-15 minutes before exposure). Dermal absorption is one powerful path into your body’s blood stream and so those chemicals really don’t stop at that skin level. Some components raise big red flags — oxybenzone may be a stronger hormone disrupter than the BPA that is being increasingly removed from plastic. When red flags are out there and we have other options, by all means let’s take them. 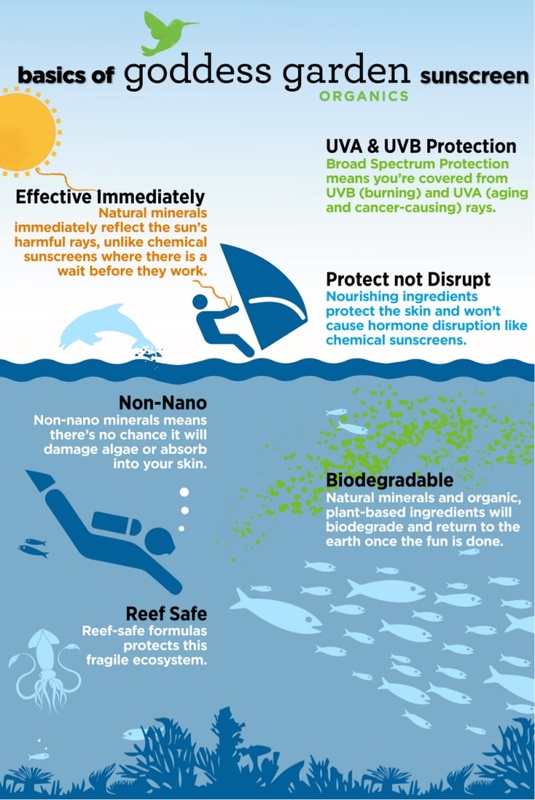 Here is a graphic from Goddess Garden that shows the difference in approaches of the two types of sunscreens. Again, it might not matter that chemical sunscreens work on an absorption philosophy if they didn’t have potentially harmful chemicals, but they do. 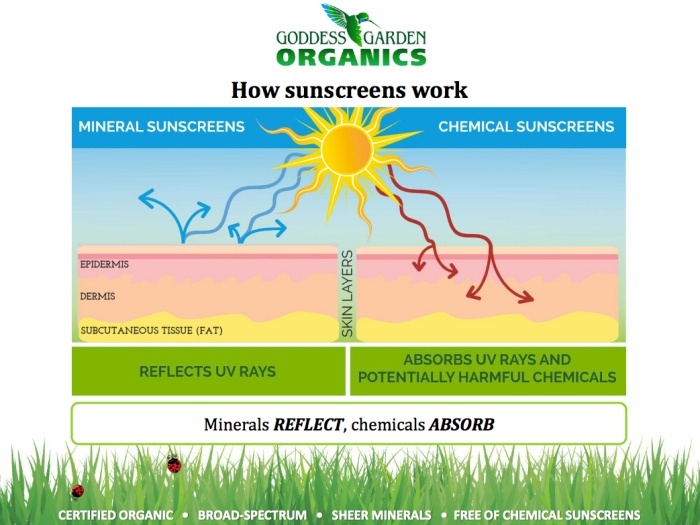 It may be years before we know how harmful they are or how much this decision matters but when there is a good alternative, it certainly is a simple change to take the mineral sunscreen approach if you are looking for a safe sunscreen (and I know you are). If you haven’t tried a natural sun block or if you find that your current product leaves you too greasy or ghoulishly white, it’s a good day to check out the product line at Goddess Garden. 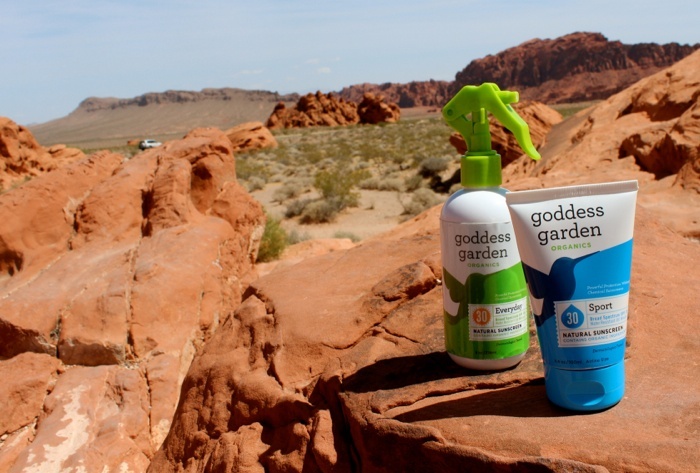 On our recent trip to Las Vegas we donned Goddess Garden products at Hoover Dam and at Valley of Fire state park. In those Nevada desert locations, Goddess Garden products were very effective. We did wear hats on our adventures but the only thing that separated our arms from the sun was the Goddess Garden Sport Sunscreen (SPF 30) and we survived the desert without even the mildest of burns or signs of over-exposure. The product has a nice, lotion-like feel. It is not “sticky” albeit it has a bit of residue. The product does go on white (and I probably over-apply it given the above history) but you can simply wipe the white residue off and still have an effective product. 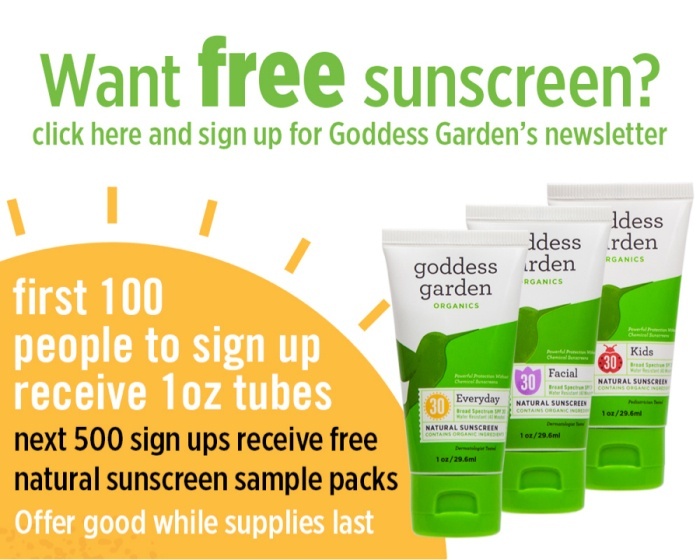 If you want to feel the Goddess Garden sunscreen on your skin, you can actually hit them up for a free sample (here). It’s your opportunity to try a product that will actually protect your skin without loading your liver with chemicals. It also happens to have the feel of a lotion. I know I’ve wasted a lot of money on sunscreen that I wasn’t particularly happy with – it just didn’t feel right. This is a great chance just to get a sample in the mail so that you can see for yourself if this product will work for you. It is a no-lose situation. Their supplies are limited so I would just get it over with and lock it in. You’ll want to use it soon too so that you can take advantage of the 20% off coupon offer that expires July 31 (coupon code: sunsafegoddess). You’re going to be out in the sun well before July 30, so the time to get the sample is today so that you can get this show on the road.